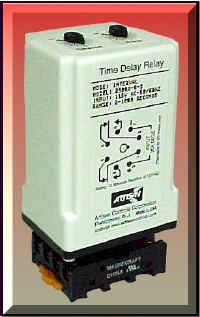 The 2300 is an INTERVAL timer controlling a DPDT set of relay contacts. The 2300 is available in a range of both AC and DC models. When operating voltage is applied the output contacts energize for a preset timing period, and then de-energize. The output contacts will also de-energize if the operating voltage is removed prior to the end of the timing period. Two potentiometers provide timing adjustment over the useful timing range. Purchase Tolerance Low time 0%, -50%, High time -0%, 30%. Ex : Timing range -3, (2 - 1000 seconds), can range from 1 to 1300 seconds, with 2 - 1000 seconds as a guaranteed minimum range.